On January 24, it didn’t take long for Paradox Cat to show the Saturday night crowd at the James Brown Arena exactly why he was favored to win the 36th annual Augusta Futurity Championship. A small horse, not much more than a pony, he came into the arena with an unassuming air. His rider and trainer, Austin Shepard, is a big man, whose feet seemed perilously close to dragging in the dirt even before the little horse started cutting. There were 45 horses in the Futurity Open class this year, and that number was whittled down to 14 for the finals. Shepard, a top trainer and competitor from Summerdale, Alabama, was riding four of them. Paradox Cat, who had the best score of 221 in the first go-round, was the ninth horse to cut. He was also Shepard’s third mount of the night. In his previous rides, the trainer had gotten an introduction to the cattle. He may not have known exactly which ones would show his horse off best, but he certainly knew which ones to avoid. In this case, there were a few light colored cattle that gave everyone trouble, including Shepard. He had chosen an especially stubborn cream-colored cow for his second cut aboard his own horse Ultra Time. Ultra Time lost that cow, after which Shepard withdrew him from the competition. On Paradox Cat, Shepard cut three solid black cattle in a row and really showed the crowd how it was done, getting down low into the red dirt of the arena, darting this way and that, keeping each cow from returning to his buddies in the herd. The crowd cheered, hooted and clapped as the little liver chestnut stallion and the big man danced together, matching wills with cattle and winning. When the run was over, the score, 222, was a full six points higher than the previous leader, Metallic Moon ridden by Gabe Reynolds and owned by Sandra and Jimmy Patton. Shepard had one more ride for the night: One Catty Cupid, owned by Joel Colgrove. Earning a score of 216.5 with that ride, Shepard took home both first and second place. Reynolds settled for third. Paradox Cat is owned by Blakely Colgrove, a 13-year-old girl from a family of cutting horse enthusiasts, who is making her own mark on the sport. Last year in Augusta, she rode her horse Sassy Lil Sue to the Amateur 4-Year Old championship, and also won the Futurity Non-Pro, the second biggest title of the competition. This year she notched another win, claiming the Unlimited Amateur 5/6 Year Old championship with Vespaa, a 6-year old stallion owned by her grandfather, Joel Colgrove. Their score of 224 in the finals put them ahead by six points and tied for the highest score of the entire competition. Before coming to Augusta in January, Blakely rode in the most prestigious cutting horse competition of all, the December National Cutting Horse Futurity in Fort Worth, Tx. Austin Shepard had entered Paradox Cat in the Open division, but lost a cow in the second go-round and was eliminated. This gave Blakely the chance to ride the horse herself in the Rios of Mercedes NCHA Futurity Amateur Championship. She won with a score of 222, making her the youngest NCHA Futurity Champion ever. In all, she took home ten major amateur or non-pro championships in 2014. Paradox Cat is an own son of High Brow Cat, the hottest cutting sire in the sport. High Brow Cat has sired seven of the last nine NCHA Open Futurity Champions and his offspring have won over $62 million. Born in 1988, he himself won $126,252 during a career that included winning the Open Classic in Augusta. He stands in Texas, and has a stud fee of $22,500. 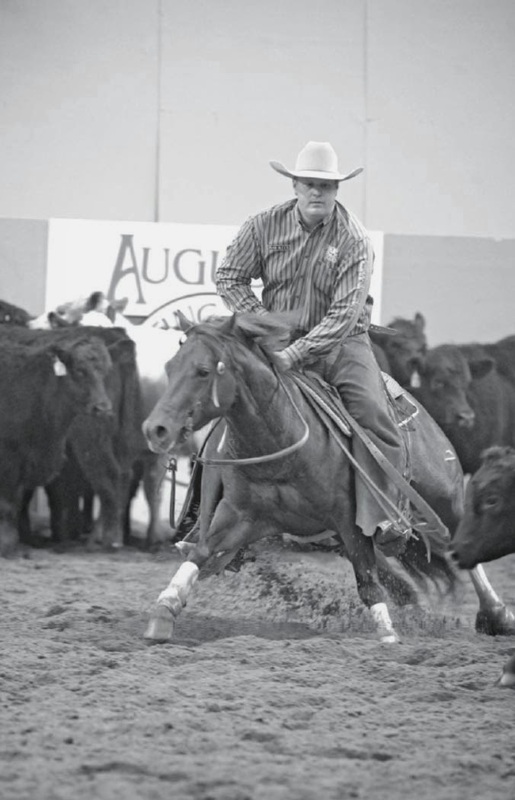 The other big winner on Saturday night was Barnswell Ramsey, 60, of Huntersville, N.C, who won the Futurity Non- Pro title riding his own Mia Sugar Baby. The eight-day Futurity crowned eight champions and gave out over $320,000 in prize money. There were 329 entries from 23 states and Canada. These included some celebrity riders, such as Mel Blount, the former Pittsburgh Steelers cornerback. Pat Parelli, the founder of the Parelli Method of natural horsemanship, showed his horse Smart Boy Peppy in the NCHA Open Class on Tuesday and Thursday (he got a 180 for 8th on Tuesday and a 217 for fourth on Thursday.) He also gave a free clinic and demonstration on Saturday afternoon. The Futurity did not have as many participants as it has had in some other years, but the quality of the competition was high, the energy was positive, and many of the riders, including Austin Shepard, are already making plans for next year. With seven Futurity Open wins under his belt, Shepard stands second to Phil Rapp, who has won the event 12 times. Although Rapp hasn’t been back to Augusta in recent years, he might return soon and he is tough to beat. Shepard has some catching up to do.